Randy Rauck is the chief flight instructor and property owner of the Freedom Flight Park. The property used to belong to his mother and father and before that his Grandfather, Joe Gallon, and great Grandfather when they moved her in 1908. Many years ago, his grandfather told him about a recurring dream he had about soaring around the valley like an eagle. Lo and behold, in 1976 Randy would realize his late grandfather's dream as he flew off of Saddle Mountain in a hang glider and he started his first hang gliding school that same year. His love for flying has never waned and that enthusiasm rubs off on students and other pilots alike. After teaching you some flying in the daytime, he'll entertain with some guitar jamming sessions around the fire with his flying friends in the evenings. If you really like the valley and the people and want to know more about real estate opportunities , ask Randy as he is a local Okanagan Licensed Realtor. 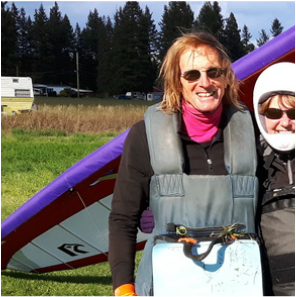 Terri Dyke started flying in 1976 and became a hang gliding instructor in 1982, so yeah, she's got a few years of experience! Couple this with her vast knowledge of hang gliding theory and history and you have an ideal instructor and tandem pilot. Additionally, she's currently in the middle of an incredible project at the flight park: building a set of hangars for hang glider and ultralight storage which will much appreciated for years to come. If you want to meet a pilot passionate about flying, come see Don Herres. His familiarity of the flying area, his patience and his experience make him one of the top local cross country pilots and he's more than happy to share his knowledge. When he's not instructing paragliding students, or taking someone for a tandem, he'll be soaring on his solo wing, playing another mental chess game in the sky. 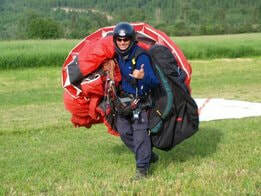 Paragliding since 2002, Dave Underwood has recently become "bi-wingual" by taking up hang gliding. The beauty of that is that he can joke around with the hang glider pilots about paraglider pilots (aka "baggies") and vice versa. A future goal of his is to obtain the same level of experience in hang gliding so that he can fully instruct and do tandems in both disciplines. Linda Verhoeven moved over to Canada a few years ago from the Netherlands and took hang gliding lessons at the Freedom Flight School almost immediately. She's a natural and has progressed quickly and even flies paragliders as well. 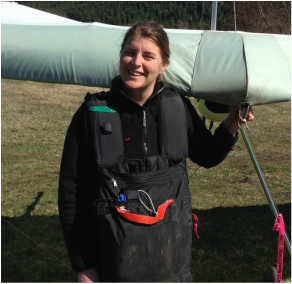 Linda is a hang gliding instructor apprentice and brings a lot of energy and enthusiasm to the park. Just make sure you don't play koob against her! Luc is a retired air force aircraft mechanic where he used to work on the RCAF Snowbirds jets! He still does maintenance on small aircraft including ultralights. 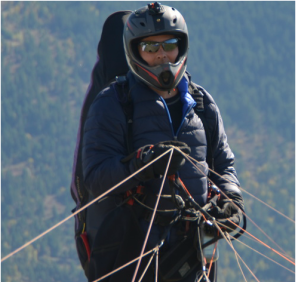 Luc has been flying hang gliders since 1999 and loves sharing the thrill of free flight with passengers. He first received his tandem rating first in the USA in 2013 and has since obtained his Canadian rating. Terry has been paragliding since 2006 after his brother introduced him to the sport and he has never looked back, just up. Flying is is his passion! Cross country is his favorite discipline. 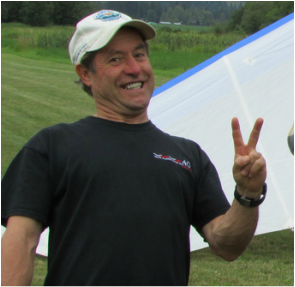 He loves the sport and the flying community and he is currently the Vice President of the Okanagan Soaring Association (OSA). His wife Jackie, who is also a paragliding pilot, is the Safety Director of OSA. Terry is committed to being an ambassador for the sport and helping others on their journey into the skies!